When my husband and I were first married the best advice we got from our parents was, "Always say a prayer together before discussing money." We have always tried to follow that counsel and not only has it helped us manage our household better, but it was also the first way we learned to counsel together as husband and wife. We learned how to pray together before discussing hard topics, we learned to listen to one another's viewpoints, to respect the revelation received by the other person, and we learned how keep our voices kind. Later on in our marriage we began doing weekly Family Executive Council (FEC) which has been a big blessing to our family. We use to be good about doing it every week, which we need to get back to doing. Now it seems we usually only have one when things reach a crisis point! The pattern of counseling together is one that has been taught repeatedly by our church leaders. They have stressed the importance of holding regular counsels, at the Stake, Ward and family level. The point of a counsel is to listen to everyone's viewpoint and then work together to figure out what God wold like you to do, not what you want to do. This is an important principle for any organization but nowhere is counseling together more important than in a marriage, where both the husband and the wife have equal stewardship and authority over their family. There is a really great story in the scriptures that models what counseling together in marriage looks like. It is the story of Jacob, Rachel and Leah in Genesis 31. If you remember, Jacob was the son of Issac and Rebekah and the twin brother of Esau. When Jacob received the birthright Esau was angry and Jacob's parents were afraid he would kill him. So his parents sent Jacob to go live with his Uncle Laban in Padan-aram and to seek a wife from among his family. Jacob ended up staying with Laban for many years and married two of his daughters, Leah and Rachel. After marrying Rachel and Leah Jacob worked with his father-in-law Laban as a shepherd for a long time. Even though Laban was never honest or fair with him, Jacob's riches began to eclipse those of Laban. This made Laban and his son's jealous and eventually, things between Laban and Jacob reach a crisis point. As it says in Genesis 31:2, "...Jacob beheld the countenance of Laban, and behold, it as not towards him as before." In response to the situation Jacob received a message from God telling him "Return unto the land of they fathers, and to they kindred; and I will be with thee." (Gen. 31:3) One would expect that since Jacob was the patriarch of the household that he would waste no time in deciding that the family should leave. especially since he'd received a direct message from God. Instead Jacob "called Rachel and Leah to the filed unto his flock" (Gen. 31:4) and discussed the situation with them. He told them about how he'd noticed that Laban did not have kind feelings towards him anymore, how he'd been honest in his dealings with their father even when he hadn't been honest with him, and finally how God had told him that he should take his family and return to his homeland. "And Rachel and Leah answered and said unto him, Is there yet any portion of inheritance for us in our father's house? Are we not counted of him as strangers? for he hath sold us, and hath quite devoured also our money. For all the riches which God hath taken from our father, that is ours, and our children's; now, then, whatsoever God hath said unto thee, do." 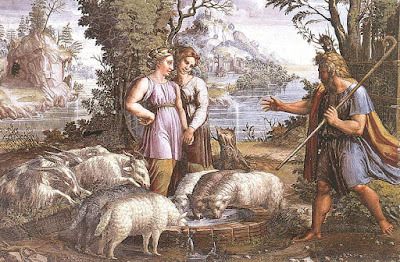 I think this story of Jacob, Rachel and Leah is a powerful one. Not only because it gives us a Biblical precedent for the idea of holding a family counsel, but because it also shows us that righteous men of God have always respected and listened to women's voices and opinions. Even though Jacob was the patriarch of the family he didn't make decisions alone. He counseled with and listened to his wives and then, after deciding together which course their family should take he took action and followed the directions God had given him. Thinking about the example of Jacob, Rachel and Leah has helped me remember to be more of an equal partner with my husband when it comes to leading our family. Sometimes it is easy for me to "jump the gun" and make choices for our family without talking to Jon, simply because I feel like I know what is best. I don't think that is how God wants husbands and wives to operate. Even when He gives specific instructions to one person He expects us to still counsel with our spouse and make decisions together. In fact, I've sometimes wondered if that wasn't what happened with Adam and Eve. Maybe the real problem wasn't so much that Eve made a mistake in eating of the fruit, because we know that was a good thing, but perhaps her biggest mistake was eating the fruit without Adam. Maybe Eve "jumped the gun" in that decision, when she should have waited until both she and Adam had received the revelation that eating was what they were suppose to do. Thinking about it this way, makes God's instructions that Eve's "desire shall be to [her] husband"(Gen. 3:16) a bit more clear. Maybe God was telling her that in the future she needed to hearken (listen) to her husband, and make decisions as a team, not as an individual. In fact, maybe the very first problem in the world was a matter of not having a good family council! I know that in my own marriage things always go much better when both Jon and I are unified about our decisions. If we aren't then things don't go so well. I think that the example that Jacob, Rachel and Leah give us of holding a family council is important. God has told us that Zion is the place where those who are of "one heart and one mind" dwell. If we want to have Zion in our marriage and in our families we need to strive to for that ideal, being of one heart and one mind in all our decision... something that is much easier said than done! Loved it! I'm going to use it as a lesson for FHE tomorrow. I think Adam and Eve did council together. It may not say it directly, but it would only make sense that their first major decision would be made together. They were learning how to be one. I'll have to go back and read it again. all right, my comment is not at all related to your post. i Hardly ever have time to sit at a computer and really look at anything, but I have a moment tonight, so here is my comment on your birth story. Ha! I LOVE the name Noelle. She is darling. Aren't we so silly for thinking we know the right way to do things and just how it should be? Will I ever outgrow that? And I liked your post about the meaning of being unclean as well. It's food for thought, but I still think it's lame to have to deal with a mess every month. Licia, I am taking classes in Marriage and Family Studies at BYU-Idaho and several of the classes advocate the council method in conducting one's marriage and family. This is a Prezi presentation that we watch to learn more about the process based on the way the First Presidency and the Twelve do it. All I can say is that learning the process changed my understanding of family councils profoundly. I read your comment a few days ago, and I have to say I've come back and am still thinking about it. I've often wondered (patiently, but seriously) about where Eve stood with Adam and with God after she partook of the fruit. Since we firmly believe what she did was right, it's been a bit of a struggle to iron out that discrepancy. Reading that last bit in Heather's post and reading your comment has given me a lot to think about in the best of ways. Thank you! Ooh, I like the idea that Adam's hearkening commandment is along the same lines as Eve's-- that they both need to listen better to eachother and to God :) Interesting idea. i think they had marriage equal relationships, what is very important in marriage!they were happy together!